In terms of popular culture that depicts winter, the past decade saw a landmark appear on the landscape. The 2013 film “Frozen” was a huge hit in any right. But in the genre of winter-themed entertainment, since there aren’t a lot of films that focus more than brief attention on winter weather, it really stands out. And this a film that takes freezing seriously as a topic. The title, ‘frozen,’ is no mere metaphor. The film is mostly set in a wintry landscape, and the lead character has magical winter powers. The signature song is presented in a palace made of ice and snow, and we repeatedly see beautiful images of winter. On the other hand, the characters all have to adapt to the consequences of things freezing around them, including the dangers it poses to them. Winter’s presence is felt throughout this film. So – what does the film have to say about the weather when things are frozen? How does it represent winter? And, of particular interest to me, does it promote winter appreciation? “Frozen” presents an appropriately balanced perspective. It continually suggests that there is a duality to winter – it is both beautiful and dangerous. It suggests that snow can be magical and fun, but that it also creates hardships. It also, since it presents so much ice and snow, directs attention to winter (and to the possibility of having an interesting time in it) in a way few other popular culture adventures do. The Ambassador of Snow gives it a high rating! “Beautiful! / Powerful! / Dangerous. / Cold! Ice has a magic, can’t be controlled,” they sing, in a line that demonstrates the film’s approach to depicting the human relationship to ice. It is beautiful, as Elsa’s magic creations suggest. It is powerful, as her abilities to create and defend herself demonstrate, as well as the way ice endangers ships. It is dangerous, to every character in the film. And it is cold, a danger particularly shown in Anna’s predicament. Elsa literally has ice magic; and key to the plot is her struggle to control that magic. I admire this perspective as a statement about ice. There are moments of beauty worth seeking out. But overall, ice is something worth respecting, and being cautious around. These are hearty men, working hard, who are aware of this duality. We also see a child, playing at ice harvesting. This establishes him, Kristoff, as someone who will learn these work habits and skills for making use of dangerous nature. The scene concludes with the northern lights, a vision of beauty often confined to areas which are cold. Next, we meet two young girls. Anna lures Elsa to play, asking if she wants to make a snowman. Amazed, both delight in the winter powers, including the opportunities it provides for creative play. But Anna is too careless in the risks she takes on the ice, moving too fast, which leads her into danger. (A trait characteristic of her personality throughout the film.) Elsa, meanwhile, is not skilled enough to protect her from those dangers. “Do You Want to Build a Snowman” might be the second most popular song from the film, with over 1.6 million downloads according to Billboard. This song is not as focused on its title as “Frozen Heart” is – and yet, it is a song whose opening question, repeated in each chorus, is about playing with snow. Perhaps nothing symbolizes children’s play in snow more than making a snowman, and this film repeatedly evokes the pleasure of that, including via Olaf, one of the film’s main supporting characters. This song provides a nice complement to the first song, focusing on the invigorating pleasures of simple transformations, rather than the harshness and discipline of the first scene. Truly, this film celebrates some of the most significant ways Americans appreciate winter. Between “Do you want to build a snowman,” Olaf, the multiple examples of characters sliding in the snow, and the snow-covered forest, there are powerful representations here of the value that comes from snow. We also get to see a reindeer pulling a sleigh, which is not a part of contemporary American life… but certainly is representative of what our holiday songs emphasize about winter. And Elsa’s key moment of self-actualization, key moment of accepting her true identity, comes as she unleashes her winter powers. This is a film which literally has a snowman has one of the main characters, a very cute snowman who provides valuable assistance as well as comic relief. The winter powers turn frightening, however. The film demonstrates how those powers unsettle just about every human in the story, including Elsa. This ice is scary, particularly when it takes spiky forms. (That part isn’t that realistic – the main dangers of ice come from how slippery it is) We see the power, and wildness, of winter. We are regularly reminded that cold is something which limits humans. Humans are part of nature, and nature writers enjoy writing about ‘oceanic’ experiences where they feel connected to the whole of nature. But even when one is properly dressed for cold weather, one usually can’t just relax and feel this wholeness – the skin grows cold, and we are reminded of a barrier separating our body from the rest of the world. Winter is like a visit to a mountaintop in presenting an effective opportunity for soaking in the majesty of the sublime, which can mix beauty, and awe… and fear. Elsa’s castle is truly sublime, in this sense; and those who shiver in this film remind us of how we, too, would feel distanced from the winter weather. (We might feel a sense of connection to other creatures who shiver as we do, perhaps.) Appropriately, Elsa, as an embodiment of the power of cold, is someone who her parents tried to isolate from others, and who later insists that others stay away from her – she represents this sense of separation which winter brings. When Elsa is pushed too hard, her powers go out of her control. She produces weird shapes, spiky (unlike the smoother ones she produced as a child). Ice, normally a key danger of winter, for her provides a route to freedom, as the fjord turns into a path she can rush across, while others must take care in walking on it. As she flees, and nears the mountain, the visuals are dominated by snow, swirl, chaos. At the climax of the film, after Elsa escapes her imprisonment, we see the chaos again, when she is distraught. The screen is covering with swirling snow, hard to see, hard to identify particular objects – active agitation. Her tremendous power to create a storm is shown; and then, so is her ability to pause it, to freeze snowflakes in the air. The film consistently suggests that some of the fears about winter (the fears of Elsa, in this case) can be unnecessary – but also that it is a very real source of danger. Ships face a particular threat, as they are frozen into the harbor, and we are shown this on multiple occasions. Ships face even greater dangers at the climax, and the ice cracking causes additional problems for those trying to move across it. We do not really get a glimpse at the everyday lives of the residents of Arundel. A few days worth of surprise winter would not necessarily cause a tremendous hardship for people living in a place that resembles Norway… except for the fact that it appears to come in mid-summer, and thus would’ve entirely disrupted the growing season. (That said, we don’t actually see farmers here – it is unclear what the livelihood of Arundel is based on.) This is set in a previous century, so the people avoid what would be the most annoying aspects of winter for most (although not all) Americans today, the need to drive automobiles in it. Given that Elsa actually has magical powers, this film can present things that we cannot see in reality. As she becomes comfortable with her power and winter, her creations grow elegant and beautiful. This development of control implies that winter is good when it is controlled properly by humans. Which is, on the whole, correct for humans, a useful reminder that the way we can best appreciate winter involves being careful and making use of the infrastructure and technology we have. But there is also an awkward aspect here, given that humans cannot actually control the weather – that is an unrealistic goal, which could lead people to make decisions with problematic consequences. “I never knew winter could be so beautiful,” Anna says when she sees Elsa’s castle. Kristoff, who we know both is an expert on ice, and someone who spent time among ice-harvesters who are aware of the beauty of ice, is overwhelmed – “Now that’s ice… I might cry,” he says. This is one of the themes of the film (and a theme I cherish) – people do not realize the beauty winter can provide. And her castle truly is beautiful. Architecturally, it is unlike any other I have seen. The creativity – by Elsa within the world of the film, by the animators in reality – is impressive. The castle remains slippery and spiky, dangerous for those other than Elsa. The chaos ends, replaced by creations which are startlingly patterned, when she takes control. (Notice how the stairway goes from spiky to smooth when she steps on it asserts her vision.) It has high-arcing stairways, startlingly vertical aspects of high-ceilinged rooms. 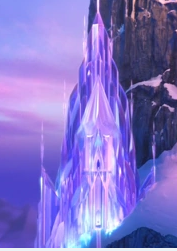 “Frozen fractals all around” – her castle builds strongly on patterns, but not the type normally seen in architecture. This is just one example of how the movie regularly shows us the beauty of ice and snow. It suggests that ice can be beautiful, particularly when it is smooth. A lot of pop culture (and nonfiction) about snowscapes focuses on polar and near-polar regions. This film is different – while it appears to be set somewhere that is near the Arctic, it drops snow out of season. Animation has a fondness for snow (as I discuss in my post “Snow in Animated TV Christmas Specials: Imagined Joys of Winter”), and it can more easily depict snow than non-animation. In an animated film, the director doesn’t need to worry about vicissitudes of weather, about trying to get the look just right, avoid melting, avoid grey slush… Indeed, is there some kind of special relationship between animation and winter? Christmas specials make up a large percentage of animation shown on network television, and many of them feature wintry landscapes. They, too, often suggest, at least briefly, the dangers of winter – the Winter Warlock, the Bumble and the storm that almost grounds Santa in “Rudolph,” Winterbolt, and Karen facing dangers of cold in Frosty. But what they emphasize is its calm pleasantry, including the fun children have with snow, presenting snow scenes as objects of warm, nostalgic charm. Key to what happens in this film is the freezing of things. Truly, this is a film where the title really does signal a lot about what we will see! So there’s an implicit interest in the frozen; the movie directs our attention to it, has us impressed by it. The plot suggests we should feel uneasy with it, but that in the end we can find a way to manage it effectively. Curiously, freezing provides deliverance at the key moment – Anna freezing allows her to avoid being killed by the sword she jumped in the way as she saves Elsa, and thus it enables both sisters to be saved. But on the whole, it does present a proper sense of the dangers of such weather. But I think that perhaps the main message “Frozen” sends, in practice, about winter, is – that looks cool! And exciting. As often occurs, a stronger message is spent by what the film chooses to spend time on, and have central to the plot, than by messages it tries to send outside of that. Here, we are both told that characters find the winter scenes beautiful – and we are shown winter that IS beautiful, with fresh snow not yet broken up by melting or yet mixed with dirt (or, of course, car wastes). There’s a LOT of snow in here, so there’s a lot of viewer attention directed to it, a lot of time looking at a variety of beautiful wintry weather. “Frozen” doesn’t hide the dangers of winter, but it also takes us on a trip through the outdoors, giving us the chance to open our minds and hearts up to the beauty winter weather has to offer. This entry was posted in Winter in Popular Culture. Bookmark the permalink.